Your telephone number can be found in the bottom left corner of your phone’s digital display and is shown as a five-digit extension number. You no longer need to dial 9 when calling an outside line. However, if you accidentally dial 9 it will still work for the first few months after the switch over. Dial the number (or use programmed shortcut button) and then lift the handset – the call will be made as soon as the handset is lifted. Lift the handset, dial the number and press the OK button to make the call. If you do not press the OK button, the call will be made after a short delay. You may have requested to be made part of a pick-up group, in which case the pick up button will flash on your phone if another member of the group is receiving a call. 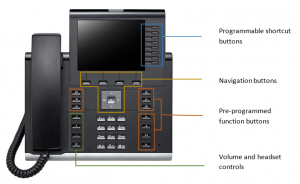 In order to take the call, lift the handset and press pick up. You will be connected instantly. The call log can be used to view missed calls plus any calls that have been recently made to or received by the phone. Press Call Log and, using the navigational arrow buttons, scroll through and select the appropriate option from the “Missed”, “Dialled”, “Received” and “Forwarded” tabs. You will need to press the up arrow from the main call log menu in order to cycle through the tabs. Scroll through the recorded call entries and press OK to dial the desired number. To put a caller on hold, simply press Hold. You can retrieve the call by pressing Hold again. Pressing DND will activate Do Not Disturb, meaning that anybody calling your number will automatically be transferred to voicemail. Phones with DND activated will have an illuminated DND button plus an icon on the digital display. To deactivate, press DND again and the light and icon will disappear. Press Forward and press “enter destination” to program a new destination forwarding. The next screen will allow you to type the telephone number to which you wish to divert your number. Press OK to accept the number and activate the forwarding. If you wish to forward your number to the same destination as last time you forwarded, simply press Forward and it will automatically use the last number. Your phone’s display will show the icon alongside the diversion number and the Forward button will be lit up red. To cancel the forwarding, simply press Forward again and the red light will disappear. You will now see your own extension number on the display again. To transfer an active call to another line, press Transfer and dial the extension of the person you wish to transfer the caller to before pressing OK. The caller will be put on hold while you make the transfer. You will then be put through to the number you dialled. If the recipient answers their phone you can tell them who is calling and put your handset down. This will then connect the caller to the recipient of the transfer. Your phone’s display will show “disconnect and return” while dialling the recipient, so if they do not answer it is possible to press OK and reconnect to the caller. Note that if you simply hang up while the transfer is being made, the caller will be cut off and will have to call back. Call the first participant. When they answer, press Conference. The first participant will be placed on hold while you dial the number of the second participant. When the second participant answers, press Conference again. This should connect all participants, but you may instead see a message asking if you want to retrieve the call. If this is the case, press OK to retrieve and then wait about 8 seconds before pressing Conference one more time. You should now be connected to all participants of the conference. Participants may leave the call at any time but if the person who set up the conference hangs up the call will be dropped completely. A college-owned conference telephone is available for boardroom-style teleconferences. This can be connected in any teaching room throughout college (except Old Library and Tower Bursary) and will always have the same number regardless of where it is plugged in. The number for the conference phone is 01865 615920 (or just 15920 if connecting internally) and is cleared for making international calls. If you would like to use this phone, it can be booked through IT during term time, or through the Conference Office outside of term – when booking, please provide at least one working day’s notice. You will be prompted to enter a six-digit PIN which you will need whenever you check your messages. Please use a memorable number for your PIN, as local IT staff are unable to retrieve this for you if it is forgotten. Once you have successfully chosen your PIN, you will receive a confirmation message on screen and the PIN will become active after 10 minutes. If you try to use your new PIN before it is ready, you will be advised that the voicemail password is not valid and your account will be locked after three attempts. If this happens, you need to wait for 30 minutes and try again – there is no need to contact support. Received voicemails will also be sent to your University e-mail address. You will need to use the default PIN provided in the e-mail sent out by IT, if voicemail has been requested for your line. IT have set up your answer phone messages to be sent to your University e-mail address. When you receive a voicemail, the red indicator on your Messages button will be lit and your phone will display the icon. You will then hear the details of your messages including the number of the caller plus the time the message was received. Follow the recorded instructions to listen to, save and delete these as appropriate. The first time you log into your voicemail (see instructions under “Checking your voicemail” for how to log in) you will be asked to record your name which will be inserted into the default voicemail message. Follow the recorded instructions in order to record your message and access any other voicemail-related options. The programmable buttons on the side of the 55G can be assigned a number of functions, such as creating shortcuts for forwarding, adding frequently dialled contacts and more. In order to program one of these buttons, hold it down until you are presented with programming options. You will need to use the row of four buttons below the display in order to interact with the menu. The buttons have two levels each, meaning that if you press Shift you will see a second page of slots for functions to be mapped to. Avoid reprogramming the Shift button as this is your way of navigating to the second page. The directory acts as a personal address book and allows you to store contact names and numbers which you can search for instead of having to type in a contact’s phone number each time you wish to call them. To access this, press Directory and use the navigation buttons to scroll through and select your contact before pressing OK to dial. To add a contact to your directory, press the button labelled More beneath the digital display followed by New Contact. You will be prompted to enter your contact’s details before pressing Save & exit to save the information. Your new contact will now appear in the list.